The historic landscape area of Llanrhidian and Landimore Salt Marsh encompasses the current extent of unimproved salt marsh north of Llanrhidian and Landimore within the AONB boundary. Whilst it is likely that this area was exploited as a marginal wetland resource providing grazing, shellfish, and reed beds from the prehistoric period onwards, little or no evidence has yet been recorded. Potential for archaeology is considered to be high as similar wetland areas elsewhere such as the Gwent Levels, have produced rich and varied evidence of past use. Inference from surrounding areas indicates utilisation of resources from a number of periods. For example, prehistoric finds at North Hill Tor and Iron Age enclosures at Tor Gro and the large hillfort at Cil Ifor. Medieval settlements on the edge of the area at Landimore and Bovehill, Weobley, Llanrhidian, Leason and Wernffrwd among others would have made use of the marshlands for grazing of livestock combined with agriculture of the grasslands. In 1583 it was authorised that any tenants of any Gower manor might put animals to graze on the salt marsh (Emery 1957). Their coastal location gave the inhabitants easy access to other resources of this area, including food and transportation links to the Loughor Estuary. Landimore, Leason and Llanrhidian in particular are centred near springs and pills that flow out into the estuary, at times these would have been navigable. The main pills crossing the area include Burry Pill and Great Pill, which in turn empty into the Loughor Estuary. Llanrhidian Pill extends due north across Llanrhidian Marsh, itself to the north of the settlement of Llanrhidian, before joining Leason Pill and entering the Loughor Estuary (Dunning and Howell 2005). Bennets Pill has been canalised and was improved to allow passage of vessels to Landimore, said to have once been a port (Edmunds 1979). Certainly such activities in the area changed little over the years and up until the mid twentieth century the reed beds continued to be harvested for thatch and animal bedding. Fishing of the pills was common and also the hunting of widgeon (Williams 2004). The area was ideal for grazing of ponies, some of which were used to carry cockles back to shore. The area is still used for grazing today. 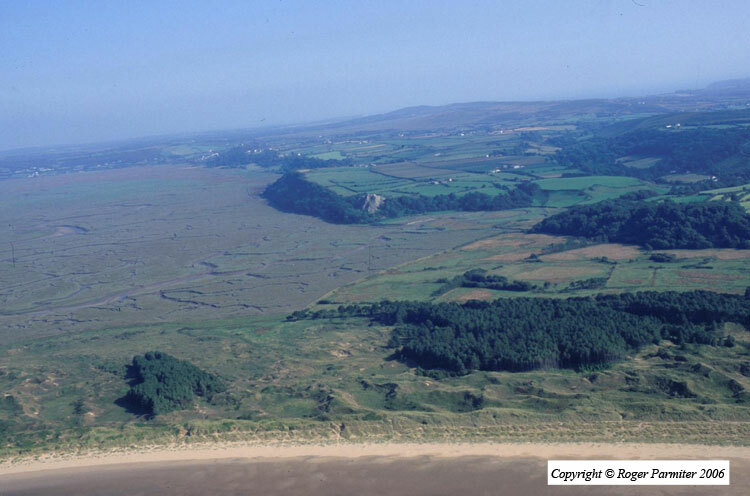 Like other areas along the Gower coastline, the marsh was used for training during World War II. The remains of a gunnery, possible barracks and a lookout tower (03046w) are located on the marshland. Remains of two mounds (03089w) are listed as having been used as practice targets for air to ground operations by the RAF. Aerial photographs taken in 1946 show the easternmost mound to be rectangular in plan, with a track running to the south.